Find everything you need to know about video poker from the official rules and payouts to winning strategies explained in CasinoSmash’s complete video poker guide! Video poker has become one of the most popular forms of gambling because unlike typical slot machines, video poker adds an element of skill to modern online casino games. Moreover, video poker games have significantly higher RTPs which can even exceed 100%! Compared to slots, video poker players make decisions that can affect the outcome of their hands positively. Based on the principle of classic poker games, the rules of video poker in terms of poker hands and combinations is easy to understand, and an optimal playing strategy can be devised using the same logic of odds as with regular poker. Not only is video poker a specific version of online poker, but there are also many sub-variations of video poker. Some of the most popular versions are Jacks or Better, Deuces Wild, Joker Wild, and Triple Deuces. The following guide on how to play video poker will focus on helping you learn the rules of the most basic of video poker; Jacks or Better. But first, let’s begin with a crash-course on the winning hands of poker. Much like standard poker games each video poker hand consists of five cards. Depending on the card value, suits and how many pairs or consecutive card values there are, your hand will pay you out a higher or lower sum. Below you will find a table that explains all winning video poker hands, you may recognize many of them if you’re a poker player or have heard some of the game’s basic rules before. Not only will you find a brief description but also an example of cards that make each poker hand. Depending on the hand, the payout will vary, and you can find everything you need to know about the rules of video poker payouts in the section below. What Are the Rules of Video Poker & How Do I Play? Video Poker is based on the game of draw poker and has virtually the same rules except that you are not playing against any other players. The objective of video poker is to receive the highest ranked five-card poker hand possible. Once you have placed your bet, click on the DEAL button and you will receive your first five cards. You have the option to HOLD any or all your cards that you want to keep. You will then discard the cards that you do not want and they will be replaced with new cards to try and improve your video poker hand. Once you've selected which cards you want to hold, click on the DEAL/DRAW button to receive the new cards to replace the ones you do not want. Once the new cards are dealt, you will have your final poker hand, and if your hand qualifies then you will be paid out based on the payout table for that machine. What Are the Payouts for Video Poker Wins? Payoffs begin with a pair of jacks. Full pay Jacks or Better is also known as 9/6 Jacks or Better because the payoff for a full house is 9 credits and the payoff for a flush is 6 credits. In terms of your odds, the way video poker machines work is comparable to video slots. Each game has a certain hit frequency and return to player rate, which you are advised to check in advance before placing any real money bets! While there is no specific video poker cheat sheet available, the following tips can be used to help you calculate your best odds and leave the game a winner! When playing maximum coins, the optimal video poker strategy varies depending on the rules of the game and the pay table. Sometimes, optimal strategies can become very complex. The video poker strategy presented in this section is adjusted for one of the most popular video poker games; Jacks or Better. However, any change in game variation or pay table might also require a change in strategy for true optimum play. 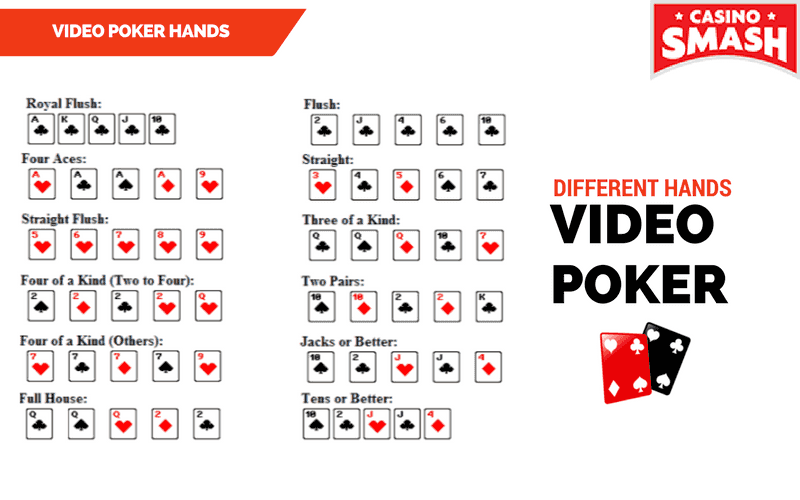 Here is how the video poker strategy table works: match your hand to the highest in the list and follow the instructions on how many cards to hold and how many to discard. 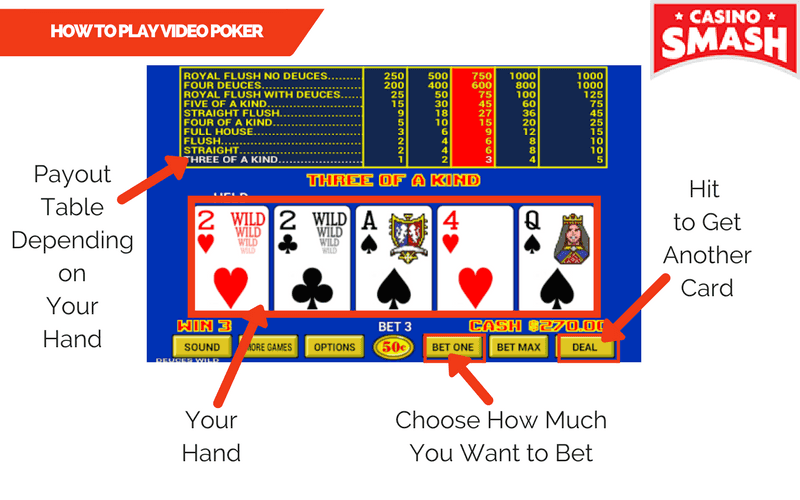 If this strategy seems a little complicated to you, you can also check out the following basic video poker tips and apply them to your gameplay first to see some quick improvements! In addition to following the foolproof strategy above, you should also make sure you follow some basic video poker tips that will help you increase your edge over the house and take home some big money! The first tip to follow comes into play if you have four cards to a Flush and four cards to a Straight. In this situation, you should always draw for the Flush based on the probability of you getting a card to complete each option. Another tip is that you shouldn’t throw away a low pair even if you have 3 high cards. This is because you have a greater expected value for that of a low pair than three unsuited high cards. Always play max coins. The Bonus for a Royal Flush with max coins played adds almost 2% to the total payout. Also, never hold a kicker, which essentially means that you should avoid holding onto an Ace in addition to a Low Pair. When it comes to the best online casinos to play video poker, we have compiled the following list based on the variety of games available as well as the generous welcome bonuses you’ll be rewarded with once you complete registration.